Mix cake mix, oil, eggs, vanilla, and sour cream together for 2 minutes. Put 1/3 in bottom of greased pan. Put 1/3 in another bowl and add chocolate syrup and chocolate chips. Mix together by hand. Place in cake pan over first layer. Cover with remaining batter and marbleize with knife, being careful not to touch sides of pan. Bake at 350 degrees for 45-60 minutes. Cool for 20 minutes. Brush with powdered sugar. Season the chicken with salt and pepper and set aside. Mix the remaining ingredients together. 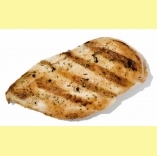 Heat, not to boiling, and serve immediately over grilled chicken breasts or over grilled vegetable such as eggplant, squash, scallions and pineapple. Serve over rice.